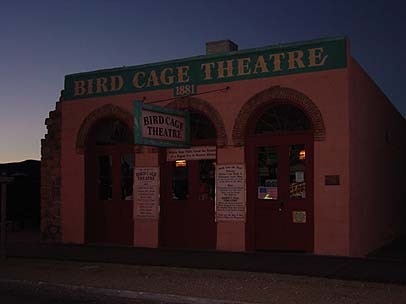 "The Town Too Haunted To Die"
Bird Cage Theatre owner Bill Hunley told me that numerous people every year see the same ghost while touring through the famous Bird Cage Theatre. The figure they see appears to be a male stage hand who walks across the stage from left to right then disapears into the walls. The ghostly figure seems to be always be wearing stripped pants, a little visor hat, and he carries a clip board. More ghost stories about the Bird Cage coming soon.